The Cotton Mill Girls are Debra Chesman, Trish Engelhard, and Dannielle Spindler-Swart. The Cotton Mill Girls play traditional music about struggles and triumphs throughout our human history of living, loving and working. Their repertoire includes traditional songs and fiddle tunes that span centuries from British Isles tunes that the American settlers brought with them, right on up through old time music, and on to more recent folk-type songs written "in the tradition." The harmonies of their three fine voices are backed up with fiddles, guitars, banjo and washtub bass. The Cotton Mill Girls take their name from a folk song recorded by the now-deceased Hedy West, describing the hard times faced by young women in the early cotton mills. 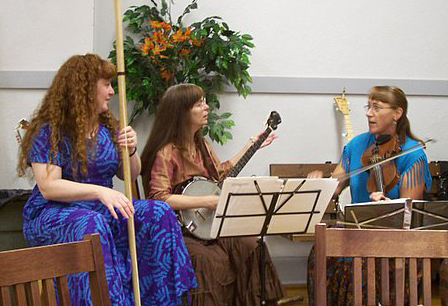 The Cotton Mill Girls are available for public and private events including historical societies, social clubs, house concerts, outdoor events, birthday parties, concerts, picnics, festivals, etc. Individually, the three have played in folk clubs, park pavilions, houses of worship, festival stages, libraries, barns,...and even in Carnegie Hall.